A weird creature that wriggled across the ocean beds 430 million years ago has been dug up in Britain. It is so bizarre it has been named Sollasina cthulhu after horror writer H.P. Lovecraft’s most famous beast – the inspiration behind the ‘Alien’ movies. The “exceptionally preserved” remains enabled palaeontologists from the UK and the US to create an accurate 3D computer reconstruction. This identified it as a distant ancestor of the sea pig – said to be the ugliest animal beneath the waves – and other types of sea cucumber. Cthuhlu appeared in a series of stories by the legendary US author – who likened it to a cross between an octopus, a dragon and a “human caricature”. 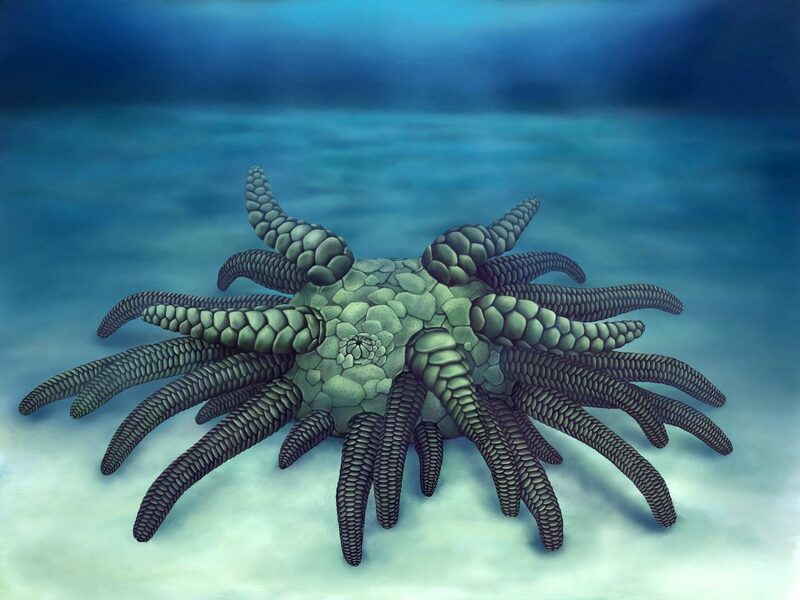 Although the fossil is only just over an inch (3cm) wide, its many long tentacles would have made it appear quite monstrous to other small marine life. It is thought to have used these limbs, or ‘tube feet’, to capture food and crawl over the seafloor. Complete with soft parts, it was found in volcanic ash deposits that accumulated in a what is now Herefordshire in the Welsh Borders at a time when most of Europe’s land mass was submerged. 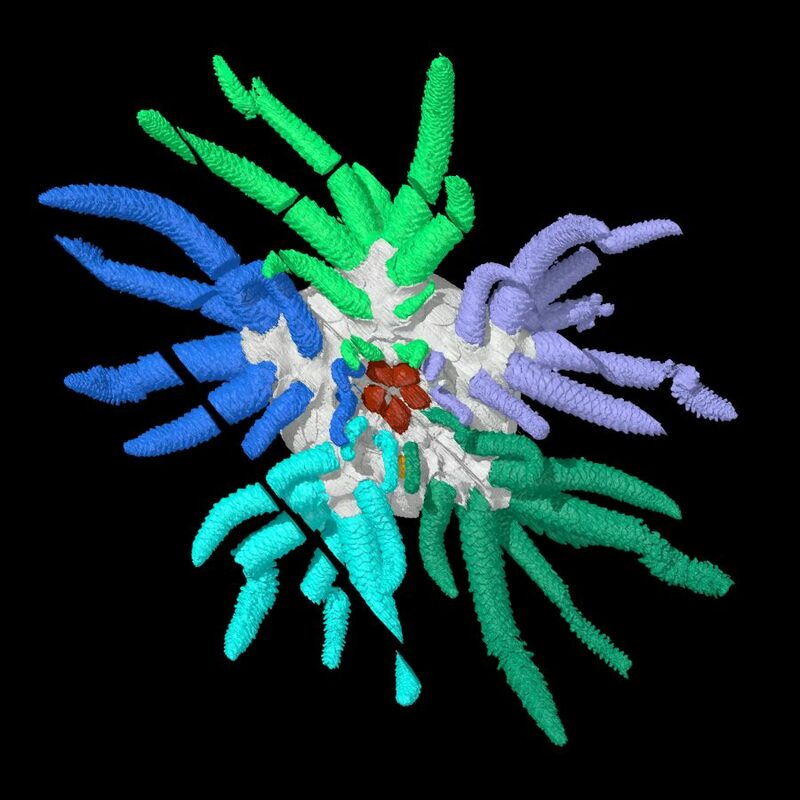 Lead author Dr Imran Rahman, deputy head of research at Oxford University Museum of Natural History, said: “Sollasina belongs to an extinct group called the ophiocistioids, and this new material provides the first information on the group’s internal structures. “This includes an inner ring-like form that has never been described in the group before. Described in the journal Proceedings of the Royal Society B, it sheds light on the early evolution of sea cucumbers – the group that includes the sea pig and its relatives. Sea cucumbers do not have eyes, but many are light sensitive. They live in shallow waters and tend to hide out during daylight hours, coming out at night to feed. They will quickly retract their tentacles when approached. Like other fossils from Herefordshire, Sollasina cthulhu was studied using a method that involved grinding it away, layer-by-layer, with a photograph taken at each stage. This produced hundreds of slice images, which were digitally reconstructed as a ‘virtual fossil’. This detail allowed the team to visualise an internal ring, which they interpreted as part of the water vascular system. These fluid-filled canals are used for feeding and movement in living sea cucumbers and their relatives. The fossil was incorporated into a computerised analysis of the evolutionary relationships of fossil sea cucumbers and sea urchins. The results showed Sollasina and its relatives are most closely related to sea cucumbers – rather than sea urchins. Co author Dr Jeffrey Thompson, of University College London (UCL), said: “We carried out a number of analyses to work out whether Sollasina was more closely related to sea cucumbers or sea urchins. Sea cucumbers belong to the group of animals called echinoderms. Their closest relatives are starfish and sea urchins. There are over 1,250 species of sea cucumbers that can be found in oceans throughout the world. Sollasina represents one of many important finds recovered from the Herefordshire fossil site in the UK, which is famous for preserving both the soft as well as the hard parts of fossils. It has provided scientists with a hotbed of discoveries, including primitive crustaceans. Some 430 million years ago much of southern Britain was positioned in warm southerly subtropical latitudes, quite close to a large ancient continent of what we now call North America, and was covered by a shallow sea. Unrecognised in his own lifetime, HP Lovecraft went on to influence Stephen King and a host of other horror writers. Howard Phillips Lovecraft is said to have brought the 20th Century horror story up to date, out of Victorian occultism into the realm of contemporary science without losing its sense of mystery.